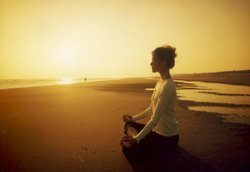 Healing Meditation is about learning to explore the many aspects of mindfulness meditation that create openings for healing. In these classes I will incorporate the work of Jon Kabat – Zinn on stress reduction from the University of Massachusetts Medical Center. Many handouts and information are given. We also have fun. Turns on genes that prevent disease, turns off genes that promote disease.